The Phuket sun shelter provides the perfect facelift to any backyard or patio space. It boasts a stylish modern frame and a high quality polyester fabric top, along with polyester decorative side curtains and nylon mosquito netting. This allows for added ventilation and protection during warm summer days. Its lightweight, powder-coated steel frame offers strength and stability while allowing for simple setup and assembly. Specially designed for equine and live stock, the Equine Run-in-Shed is the perfect shade and shelter solution . Provides instant shade and protection for live stock and can be moved to meet your requirements. Constructed of high grade 1 5/8 in. steel frame. Every frame tube and connector goes through a proprietary 13 step steel surface prep process for maximum durability. DuPont Premium powder coat is baked for an even finish that will not chip, peel, rust or corrode. Advanced engineered RIP STOP tough woven polyethylene fabric is triple layered, heat bonded for ultimate 4 season performance. Hot air fused seams are 100% waterproof, UV treated inside, outside and in between with added fade blockers, and anti fungal agents. High profile white interior provides enhanced illumination. Easy to set up and take down as needed with slip fit connectors and best in class tubing. Open end design allows easy access at both ends. Bring the indoors out with the Francfort mural gazebo. This unique sun shelter is designed to be the perfect extension of ones home, allowing enjoyment of the outdoors while being sheltered from the elements. Crafted from durable aluminum, it can withstand the toughest of weather conditions and can be left up year round. The retractable roof is designed to provide shade to your home and protection from the suns UV rays. With its nylon mosquito netting, the Francfort is perfect for a dining table or conversation set, for hosting an evening get together while providing protection from bugs. The addition of the high quality polyester curtains can provide more intimacy and privacy while adding an extra level of sun protection. Create the perfect haven in your own backyard with this beautiful 4 season mural sun shelter. Improve your outdoor living space with the four season Genova Sun Shelter. It provides a shaded space to relax by the pool during hot summer days as well as a haven for friends and family to gather for an outdoor dining experience. It is at the forefront of the new wave of outdoor living design with its durable galvanised steel roof and high quality powder-coated aluminum frame. It includes one set of durable nylon mosquito netting which keeps bugs out and reduces wind and sun exposure. The Genova will provide years of protection from the elements. 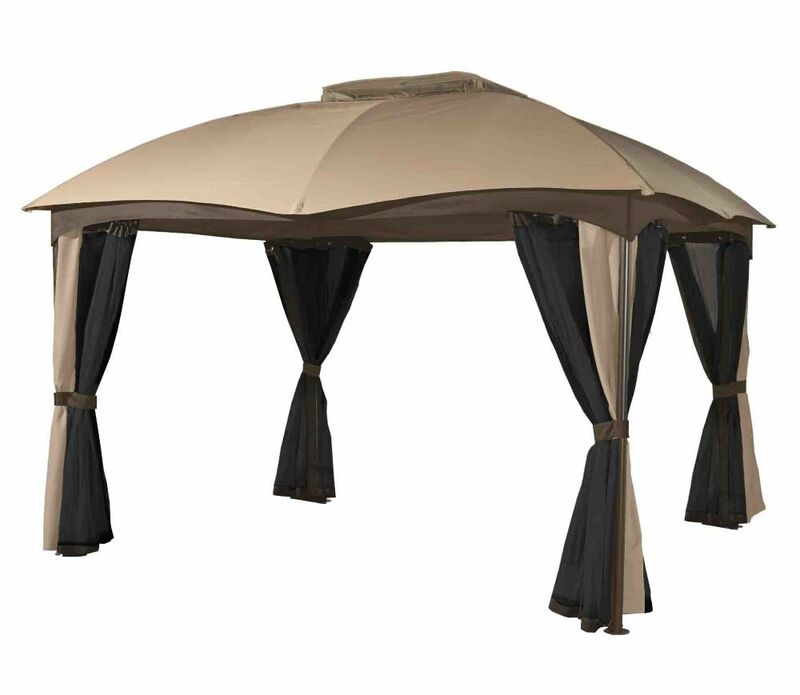 This stylish Piati gazebo is a perfect addition to your outdoor setting. Crafted from durable aluminum and steel, this sun shelter includes triangle shaped side poles and a steel cross beam for extra support as well as curtains and mosquito netting. Inside post dimensions are 10 ft. x 12 ft.
Phuket 10 ft. x 12 ft. Sun Shelter in Beige and Brown The Phuket sun shelter provides the perfect facelift to any backyard or patio space. It boasts a stylish modern frame and a high quality polyester fabric top, along with polyester decorative side curtains and nylon mosquito netting. This allows for added ventilation and protection during warm summer days. Its lightweight, powder-coated steel frame offers strength and stability while allowing for simple setup and assembly. Phuket 10 ft. x 12 ft. Sun Shelter in Beige and Brown is rated 3.0 out of 5 by 27. Rated 2 out of 5 by Pepdav from First winter over We bought this gazebo last summer and we’re just in the process of starting season two with it. Over the winter I had three spots on the curtain railings that had the welds come apart. The welding points on this are not very good. It is more like they tack welded it and did not weld all the way around the bars. For the amount of money you pay for this I would expect a little more professional construction. Rated 4 out of 5 by Sandy from Cozy The gazebo was easy to assemble and looks good as a finished product. A defective part needed to be replaced which added 2 weeks to the time to assemble it. Rated 1 out of 5 by Donna from Beautiful but not well constructed. Not sturdy! I purchased a couple of weeks ago and it is not holding up, joints are separating and overall not well designed. I had to return it. Rated 5 out of 5 by Kirk from Excellent We have had ours for 3 years, have not have any problems, We leave the frame up all winter with no issues at all. If it wasn't for our dog going though the screen, that's our only problem now we have to look for a replacement screen. It has the best roof design, never had water pool up like the other Gazebo's we have had. Rated 1 out of 5 by rena_5 from Do not buy!!! I bought this canopy in the spring to use this summer. I have had cheap canopies over the years for our deck leading into our pool. We thought we would purchase one that was a little more money expecting better quality. The canopy did not last 3 months. All of the spot welded areas let go and the top metal point on the canopy almost came through the window. Extremely disappointed!!! The cheaper canopies lasted @ least 3-4 full summers. Definitely want a full refund!! A lot of money spent on alot of JUNK! Can i buy a replacement canopy ? You can contact our Customer Service Department at 1-866-901-1649 with your model number in hands. They will be able to help you. Would anyone know how high this gazebo is at the top of the side walls (not in the middle at it's highest point...the measurement is provided)? The posts are 79.7'' high and the headroom under the crossbeam is 75.7''. You can contact our Customer Service Team at 1-866-901-1649 taking care of having your model number in hand. They will be able to proceed the order with you. Does this come with privacy panels? No it doesn't. Only decorative curtains which are at each corner. Good day, Depending on the needed parts, I would suggest you to contact our Customer Service Team with all the letters corresponding to the parts you would need. If ever you really need to replace the entire structure, you are better to purchase another complete sun shelter. The cost of all separated parts is always more expensive than the shelter itself. You can reach our Customer Service Team by phone at 1-866-901-1649 #2807 or by email at info@sojag.ca.